When battle starts, quickly press the sleep/wake button and the Home button simultaneously to capture the screen and press the Pause button at the top right corner of the screen. The timer gets activated when your wizard comes closer to the first enemy. You will have to take a screenshot and press the pause button before he approaches his first enemy. Now double-press the home button to minimize the game. Go to Photos to view the screenshot. Keep the screenshot opened, memorize/note down the letters on the rack on a piece of paper. Open your browser and visit wordsolver.net. Enter the letters on the empty box and press the Go button. 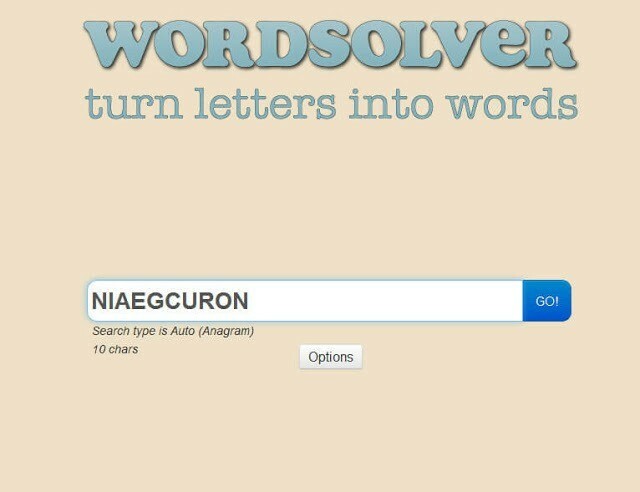 The online word solver will return a list of words starting from longest word to 2-letter words. Ignore the 2-letter words. The minimum letter count is 3 in this game. Next, note down all or a few longer words. Write them in a piece of paper or enter those words on your notepad. 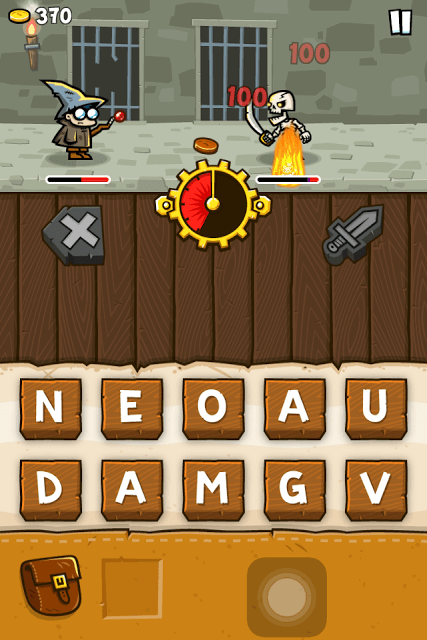 You can also note down 3-letter words that can deal extra damage to enemies. There are certain accessories like robes or hats that grant such damage boosts. For example, equipping the weathered hat will ensure that 3-letter words do 2x more damage to enemies. Double press the home button to view open apps and tap the game to maximize it. Press the “Resume” button and start spelling 3 or 4-letter words that the Wordsolver returned. Do not spell longer words to attack common enemies. Once any word is created, it can’t be spelled again in that level, so save longer words for boss monsters or hard-to-beat enemies that may appear before boss monsters. I don’t encourage cheating. 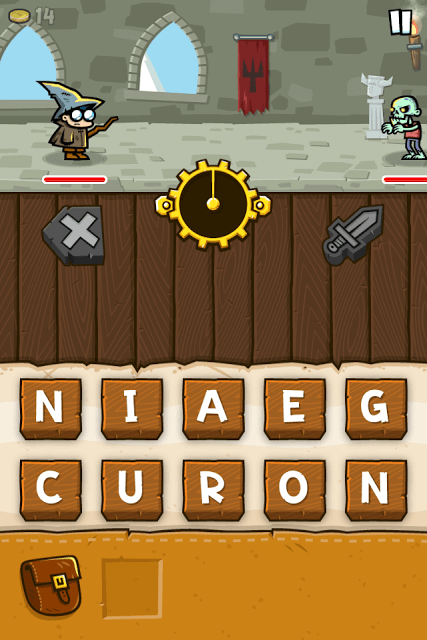 Instead of using wordsolvers, try to solve the word puzzles on your own. using such tools spoils the fun. When you tap a level, a window pops up showing the next wave of enemies. Knowing who’s coming up next will help you devise a spell plan for monsters. After checking the enemy line-up, try to unlock and purchase the Monsterpedia, which can be acquired by replaying previous levels (I got it by replaying tower level 1). The Monsterpedia provides key information about each monster that you have defeated. And because you will meet the same monsters in later levels, this book will be very handy in knowing their weakness and resistance to certain wands. Next, follow the word solver cheat, note down words and form them according to the enemy line-up. This way you can easily defeat them. Save longer words for the final monster. Wands, robes and hats have unique characteristics that will help you defeat enemies. Upgrading wands will increase the total damage to enemies, whereas upgrading robes and hats provides various battle benefits like increased health, timer delays and bonus damage for 3 or 4 letter words etc. 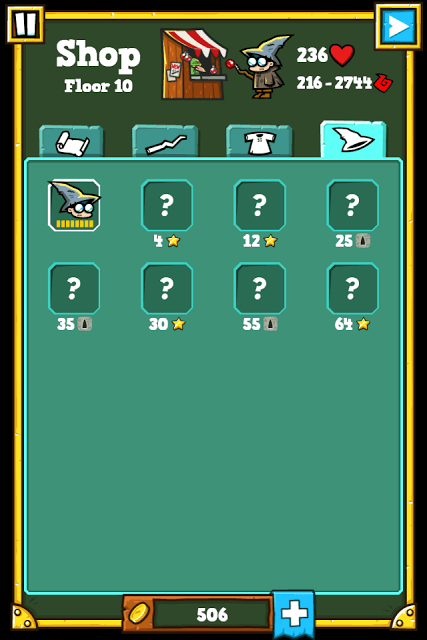 Before attempting a level, try to upgrade your equipped wand, robe and hat with the coins that you have received from reward chests and tower levels. If you don’t have enough coins, then replay previous levels to earn them. Replaying previous levels will also let you get stars, which is used to unlock gear slots. You may also save coins to buy better equipment for your wizard. You will receive plenty of coins from rewards chest that opens every 8 hours. The higher the tower level you are in, the better equipment (and more coins) you will receive from the chest, which provides 3 reward choices. Choose any one of them. You can also replay previous levels to earn some coins. Once you have the required coins, you can purchase a wand, a new hat or robe. Besides receiving 100 coins on your first login, you will also be able to defeat monsters faster by logging in to Facebook. After logging in to Facebook, monsters will have less health if you and your friends are playing the same tower level. You will also receive better daily chests if you have plenty of friends playing Spellspire. If the jumbled letter rack contains letters “S” “E” and “D”, then try to form plurals of words or adding a suffix to a word. This way you can create two words from the same letters. So if the rack contains letters like K, L, I, L, S, you can form two words – KILL and KILLS – to attack enemies. You will have to unlock slots by reaching certain levels and using stars, which can be collected by playing previously completed levels. Go to Shop to find out how many stars are required or what level should you reach to unlock a slot. Unlocked slots contain new gear, which can be purchased using coins. Wands belong to certain elements that can be weaker or stronger against enemies. Before buying a wand check its element symbol and the damage it can deal to enemies. Read the Monsterpedia to know which element an enemy belongs to and his weakness/resistance against elements. When forming words, search for anagrams. For example, MADE anagrams to DAME. There are several others, such as MAGE and GAME. This way, you can create two words from the same set of letters. You can also read Tip No. 1 and use a word solver to get more anagrams. Don’t look at the timer while forming words. They can be a distraction and may make you more anxious, causing a delay in spelling out longer words. You can even start forming a word to attack monsters before the timer gets activated. When the game starts, the timer isn’t activated until your mage comes closer to a monster. By the time he comes near him, quickly form a 3-letter word to deal some damage to him.